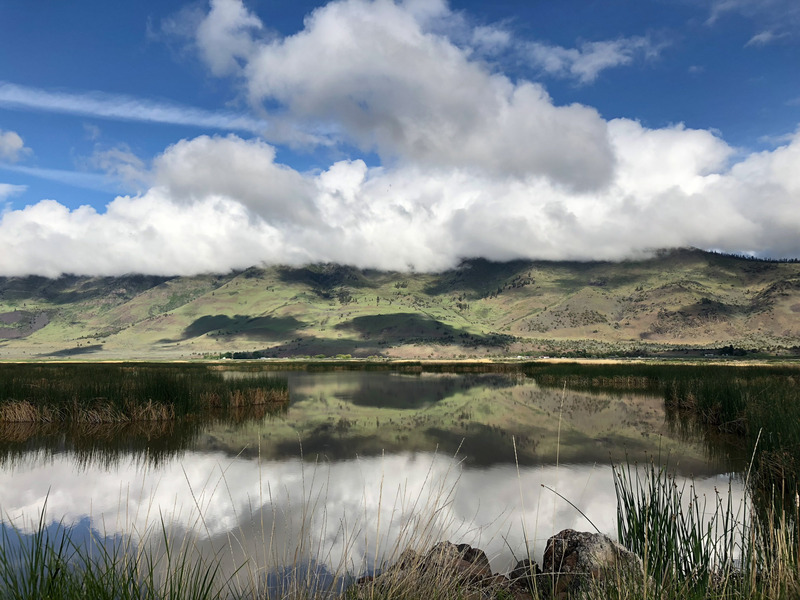 Over Memorial Day weekend Tomas was scheduled to volunteer with Oregon Timber Trail working on mountain bike trails through the Fremont National Forest so I thought it would be the perfect opportunity for me to explore Summer Lake Wildlife Area. Tomas worked hard chainsawing through trees and brushwhacking trail obstacles, while I binged on birds for five days. This was Lake County which I hadn’t visited since a Cabin Lake trip in 2016. 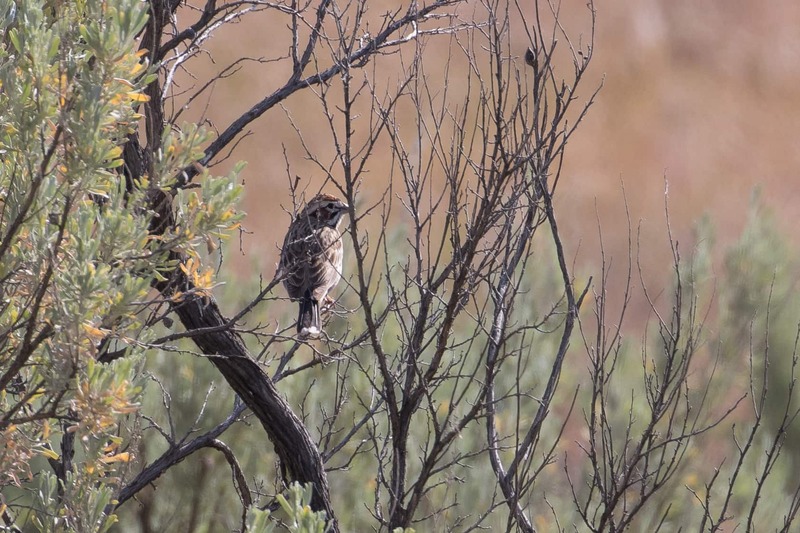 I saw 145 species this trip, 102 new county birds, and one state bird. But first, I had to get out of the forest. 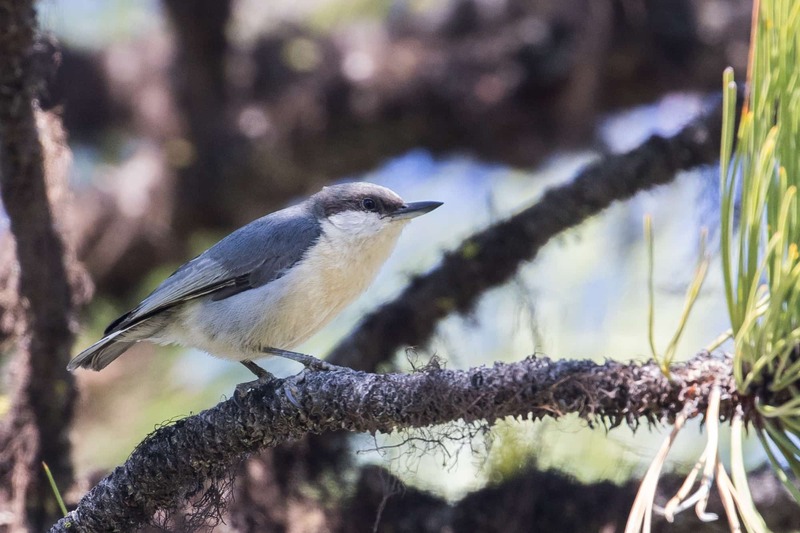 After dropping Tomas off, I spent three hours traveling the 24 miles down to the valley picking up Lewis’s Woodpecker, Pygmy Nuthatch, and Clark’s Nutcracker. 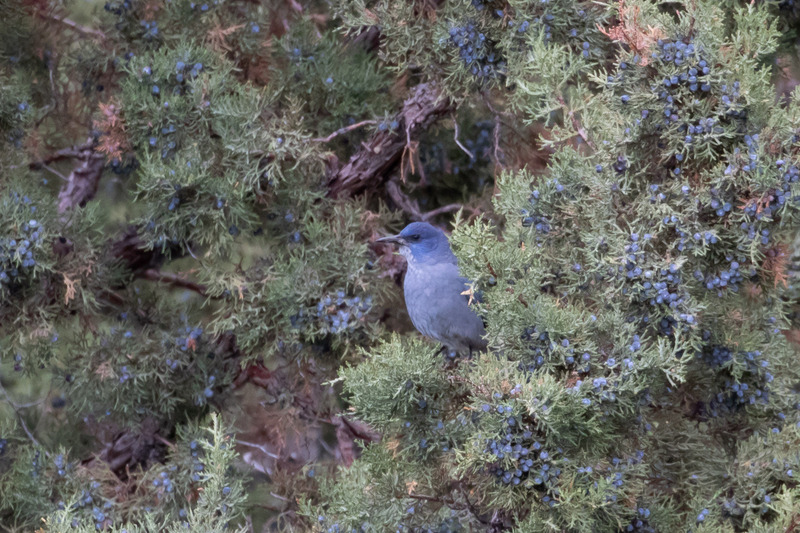 I saw a Pinyon Jay interested in the juniper berries. 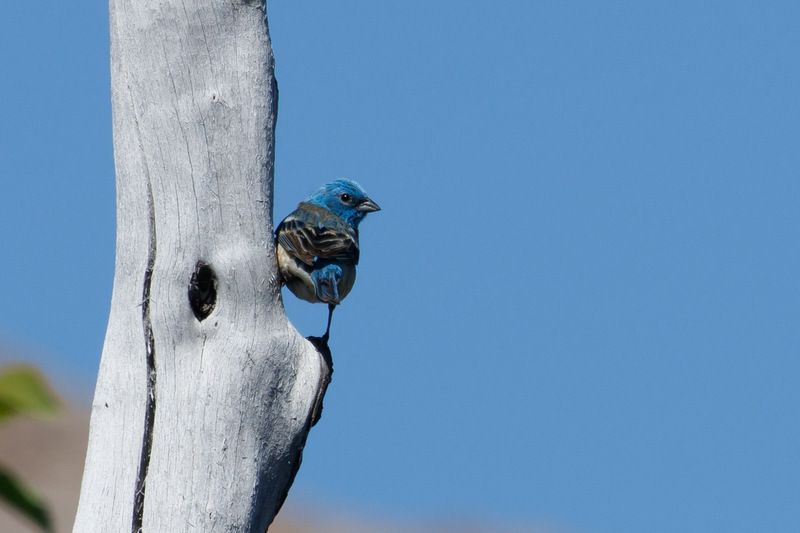 And a few migrating visitors included Lazuli Bunting. 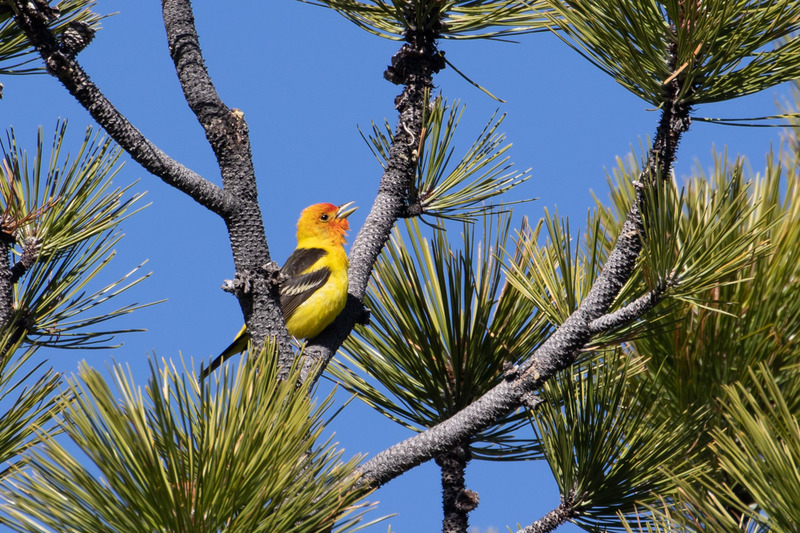 In one patch of pines I saw Townsend’s Warbler, Warbling Vireo, Cassin’s Vireo, and a singing Western Tanager. 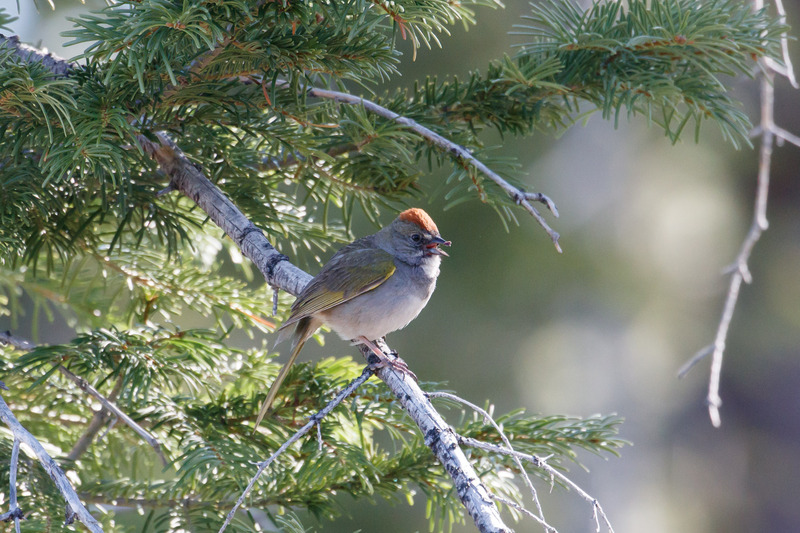 There were Red Crossbill, Cassin’s Finch, Chipping Sparrow, Mountain Chickadee, Brown Creeper, and a fun favorite, Green-tailed Towhee. 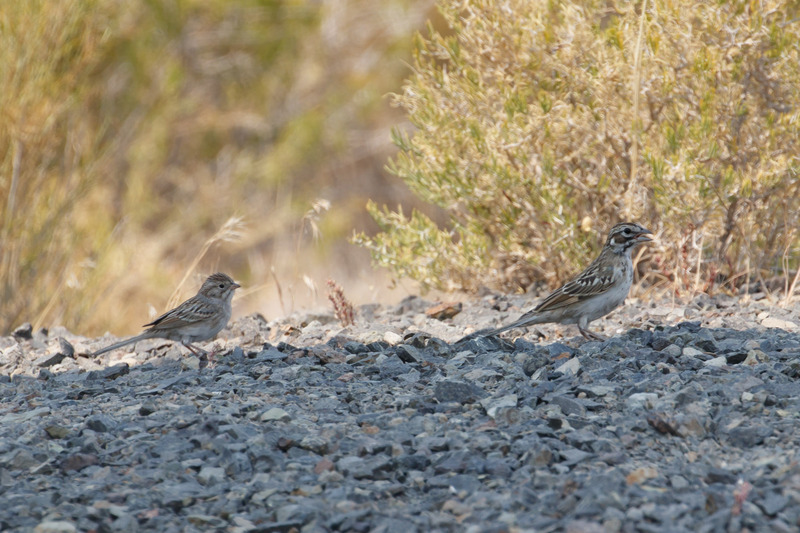 Sparrows included Brewer’s Sparrow, Fox Sparrow (Slate-colored), and I even found a nice looking Lark Sparrow. Flycatchers were singing loudly (thankfully), Olive-sided (quick-three-beers! 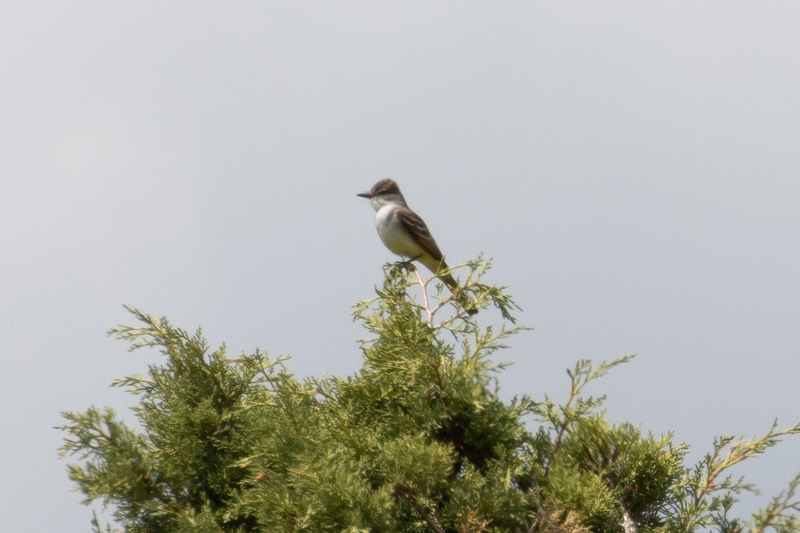 ), Western Wood-Pewee, Dusky, and I think the best sighting was this Ash-throated Flycatcher. Eventually I made it down to the wildlife refuge. But then I had to pick up a parking pass from the gas station, which unfortunately only takes cash. Pro-tip, bring enough cash! I had to dive 40 minutes south to Paisley to the nearest ATM to pull out enough to cover for an annual pass. While in Paisley, I figured it was worth checking out Lover’s Lane, an eBird hotspot I’d noticed had some target birds I was hoping for. This turned out to be an excellent decision. 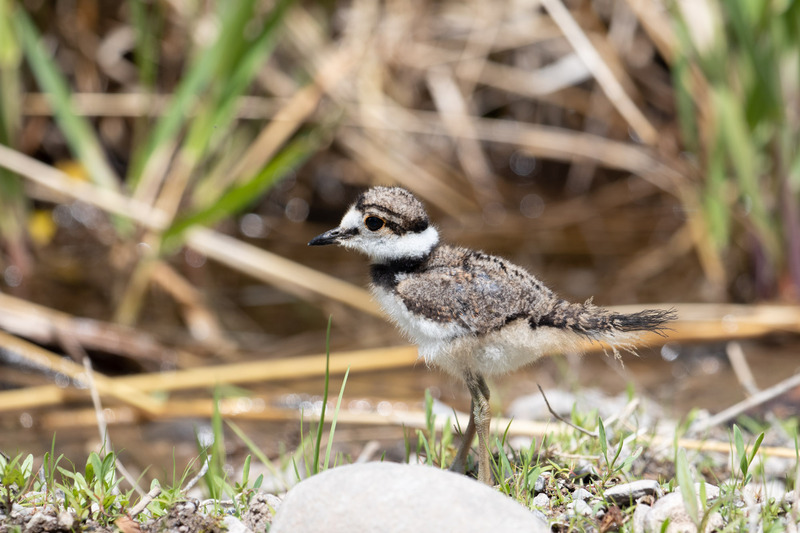 I started down the farm road and immediately stopped for this adorable baby Killdeer. It bobbed its head and squatted down looking just like a rock. 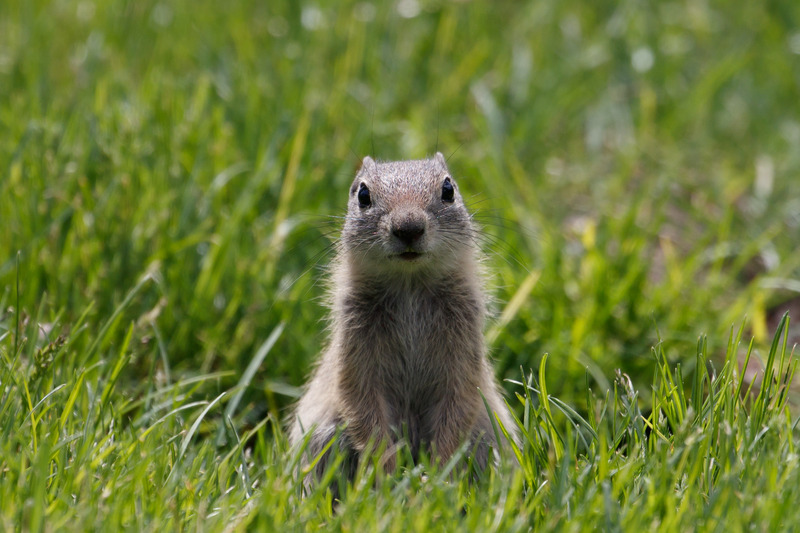 Of course the parents were shrieking nearby, so I did not stay long. 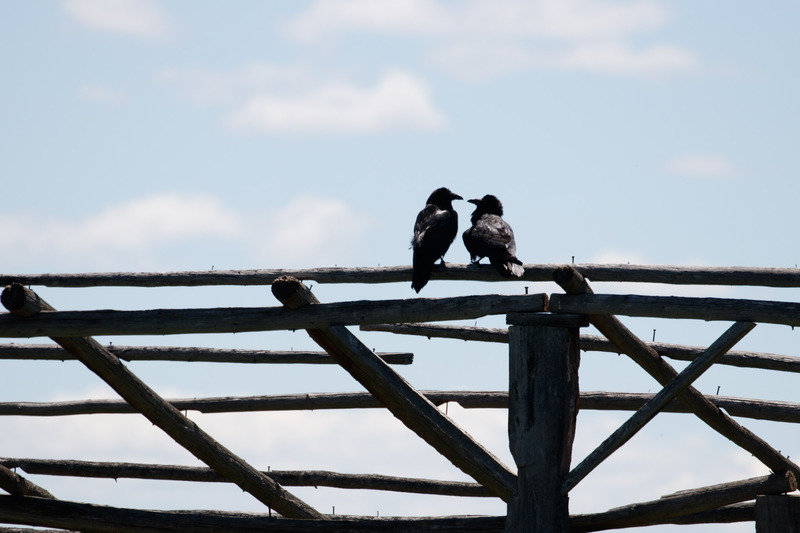 The pastures next to the road were flooded creating huge puddles, but since it was a hot day, the birds were totally into it. 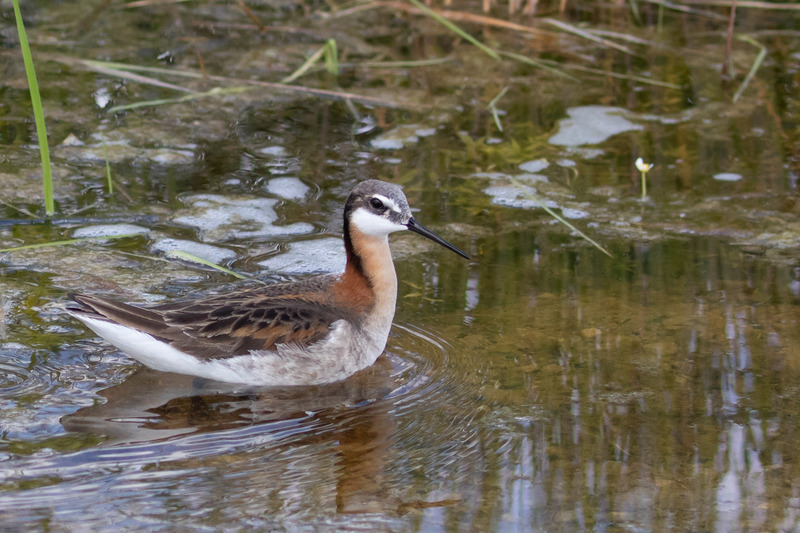 Not far along, a freakin Wilson’s Phalarope decided to land in a puddle right next to the car, then it fed and bathed right next to me. It was like a dream. 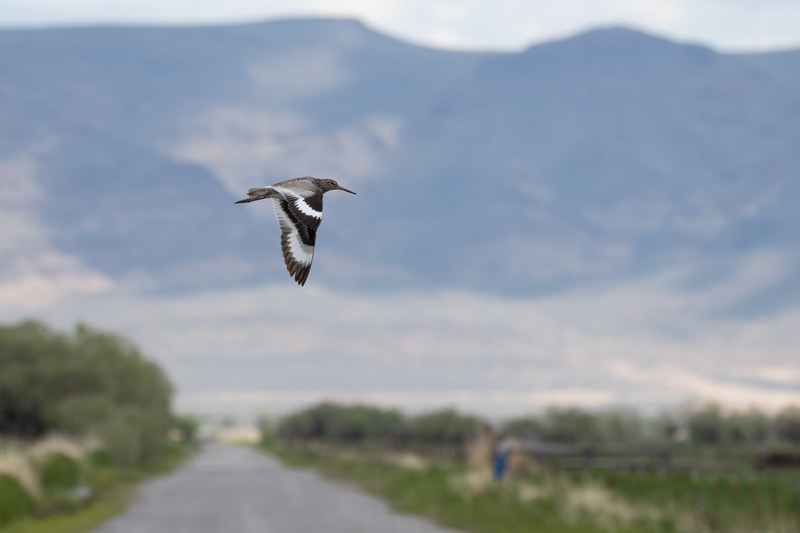 The dream continued when I noticed a shorebird in the road up ahead. 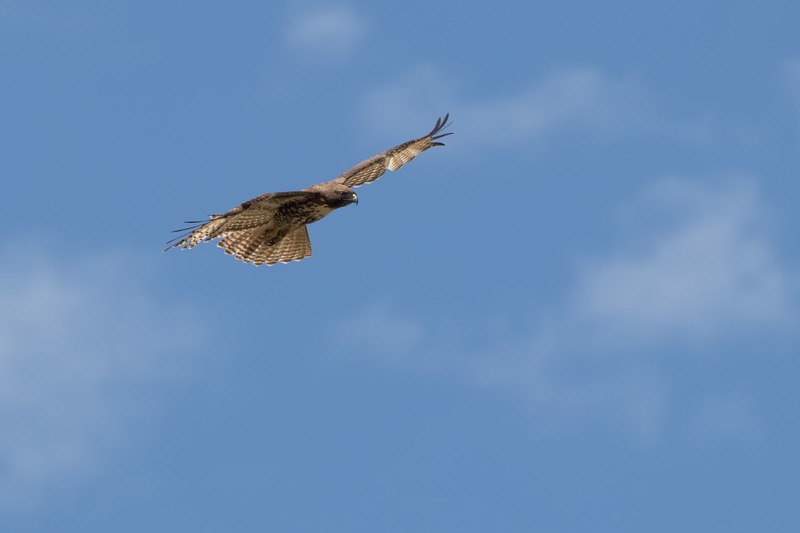 I got closer, but it flew into a field. 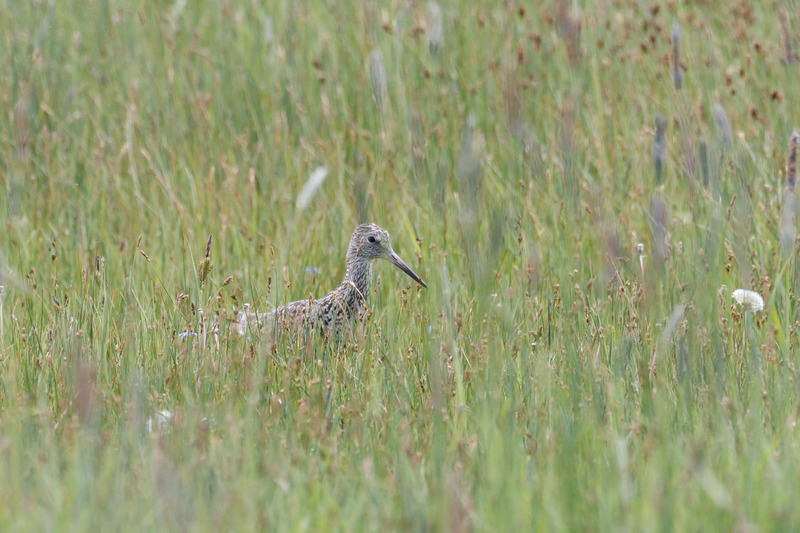 It’s a Willet! 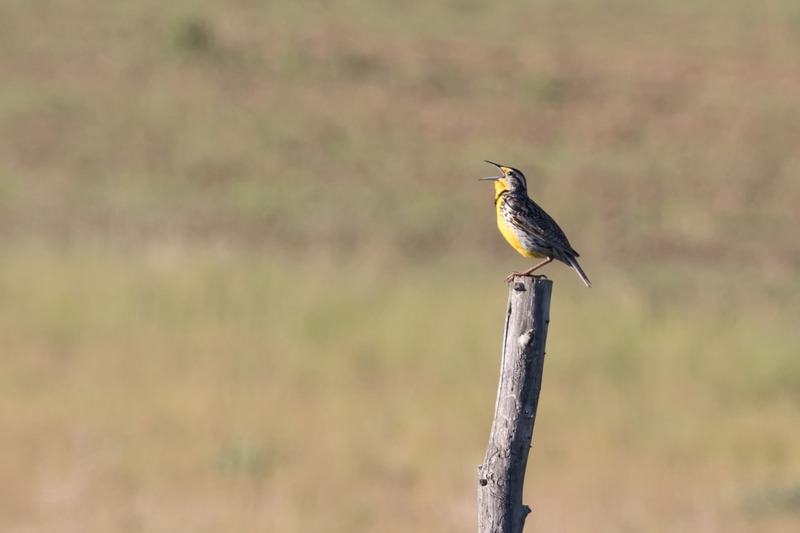 A state bird! 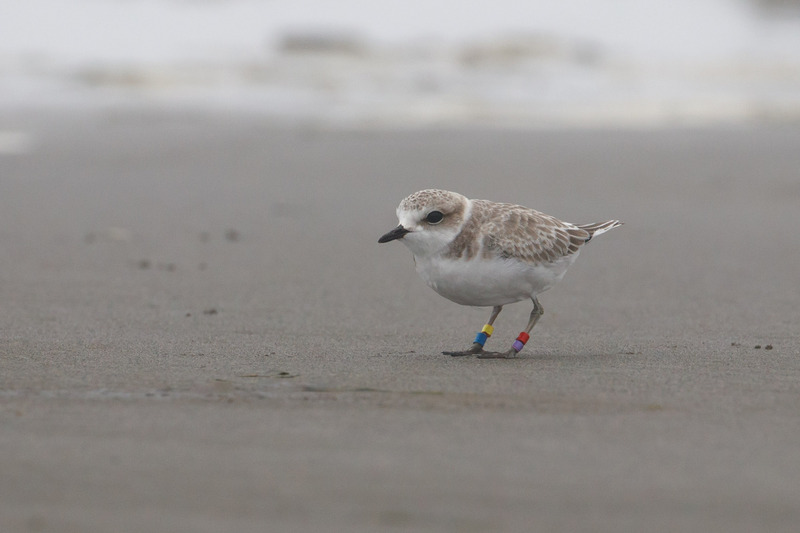 I was so excited to find it, since I’ve only seen them on the coast, and mostly in Florida. 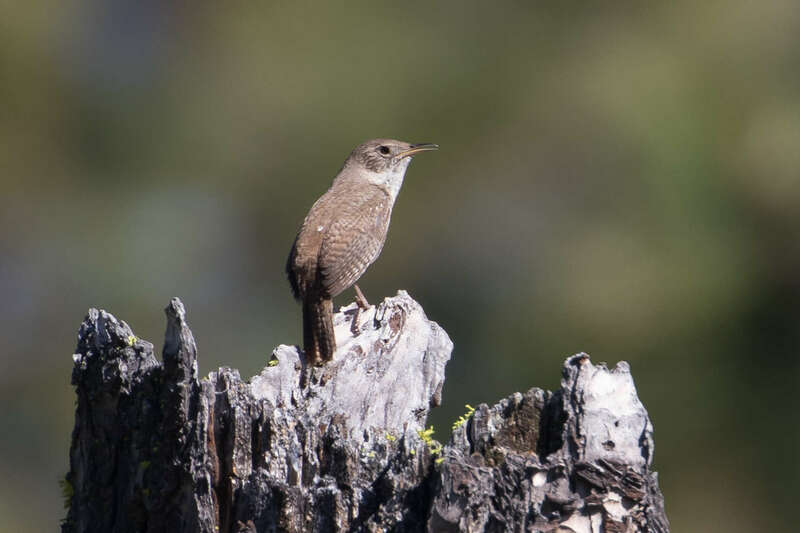 They breed here in the desert in this small part of Oregon during spring and summer. 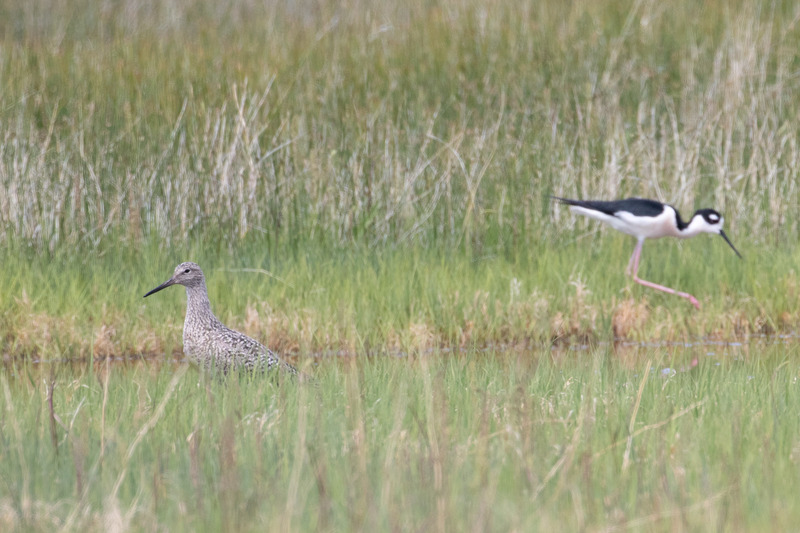 It flew over the road then landed on the other side to hang out with a Black-necked Stilt. 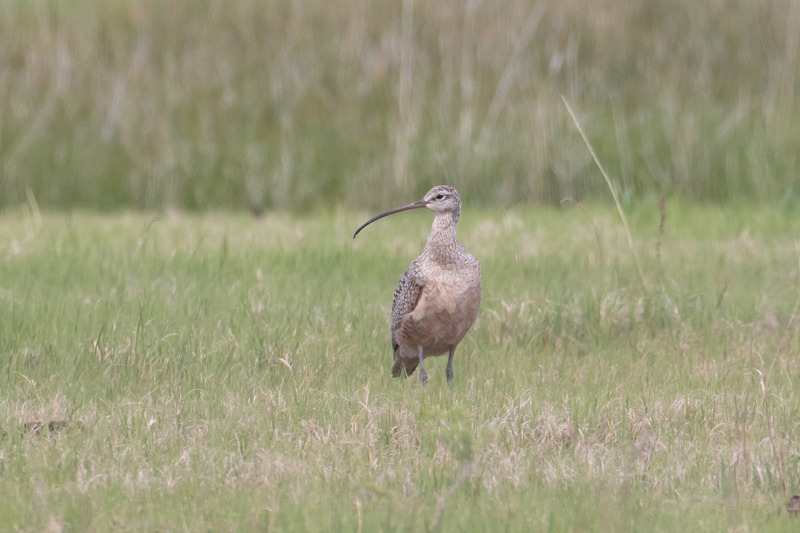 Just when I thought it couldn’t get any better, I heard “CurLI, CurLI, CurLI” from a Long-billed Curlew in the same field. 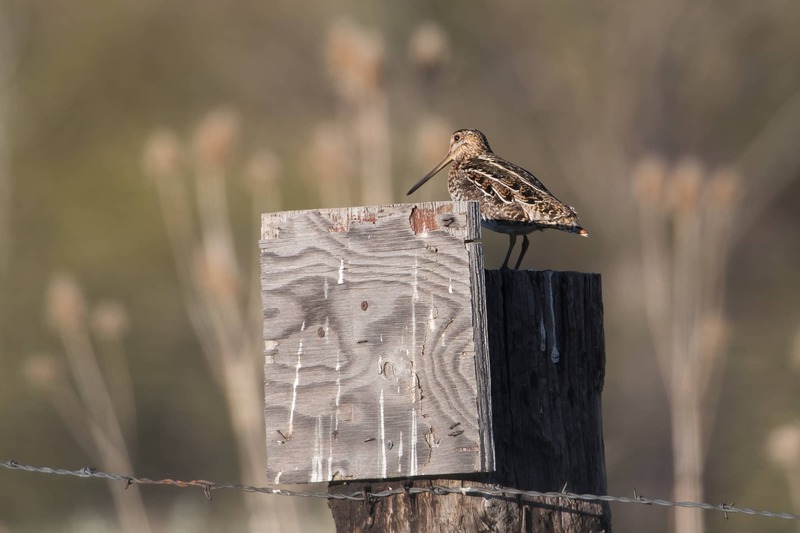 The Wilson’s Snipe and I couldn’t believe our eyes. 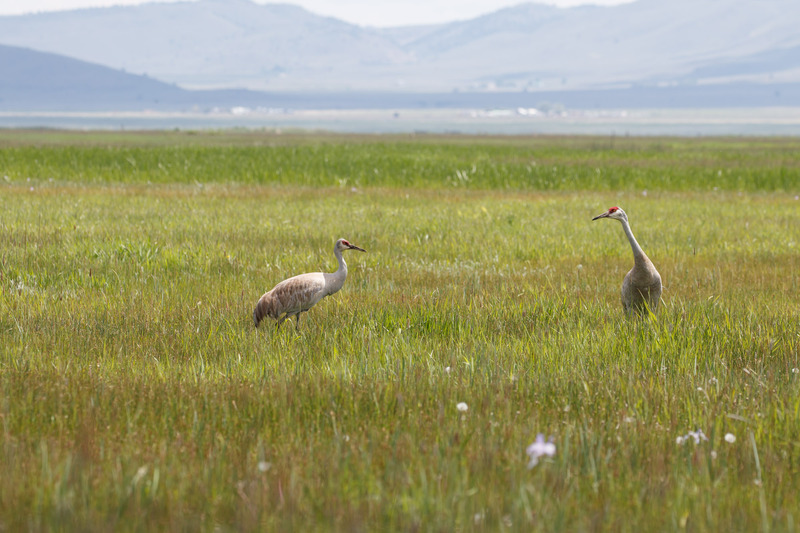 Neither could the Sandhill Cranes. Yep, they were there too. It was the best kind of party, everyone’s invited. 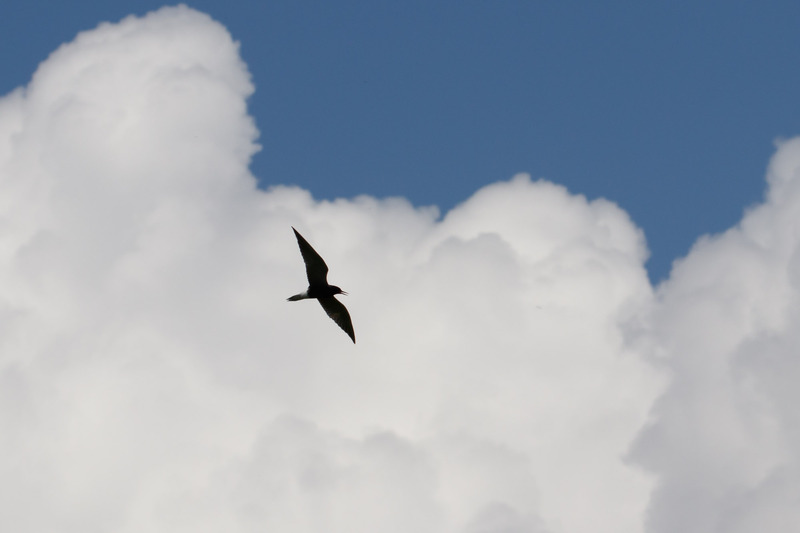 Eventually I made it to the end of the road and about died with happy when I saw another target I’d hoped for, a Black Tern. 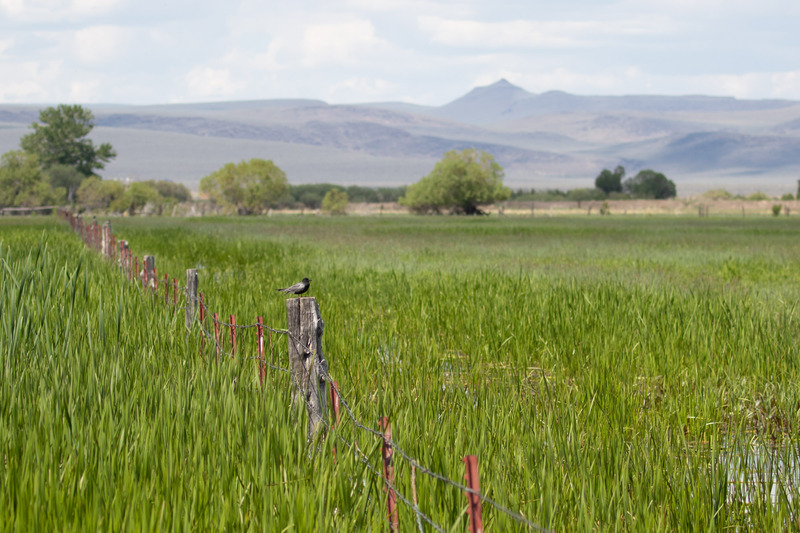 I thought the road might end at a water feature, but it was just flooded farmland, and the terns seemed okay with that. 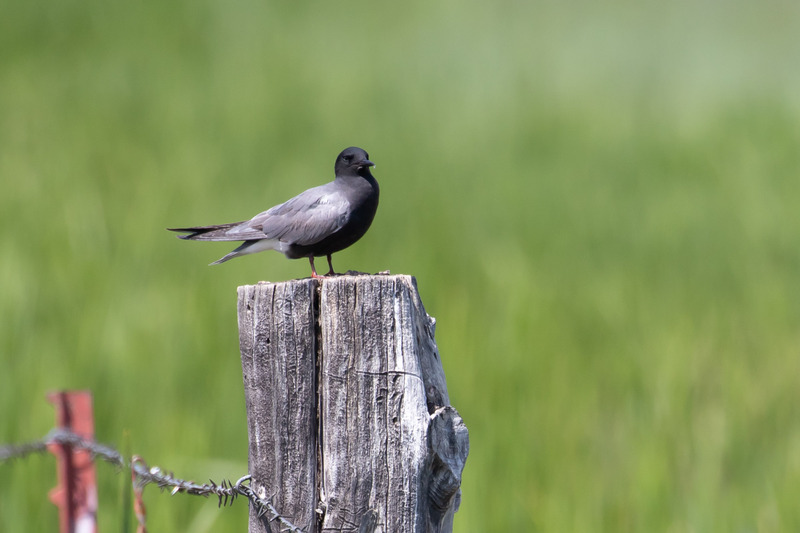 I’ve only seen Black Terns one other time at Perkins Peninsula Park in Eugene and the looks were bad enough that I didn’t write about it. But here I could soak it in, it was the best I could hope for. Smitten with Lover’s Lane I backtracked to HWY 31 and made my way back to Summer Lake where I could buy a parking pass and finally explore the wildlife refuge. Welcome to Summer Lake, I hope you enjoy your stay. The finale! In the morning Tomas confirmed his bike-tour was over and he was ready for a pick-up. 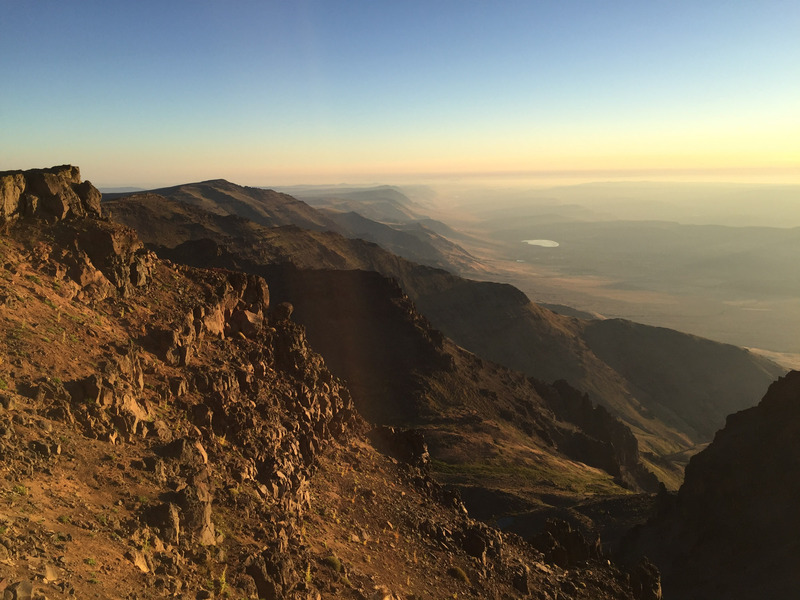 I was ready to leave early before the hunters returned anyways so I said goodbye to Steens Mountain and made way back to Frenchglen. 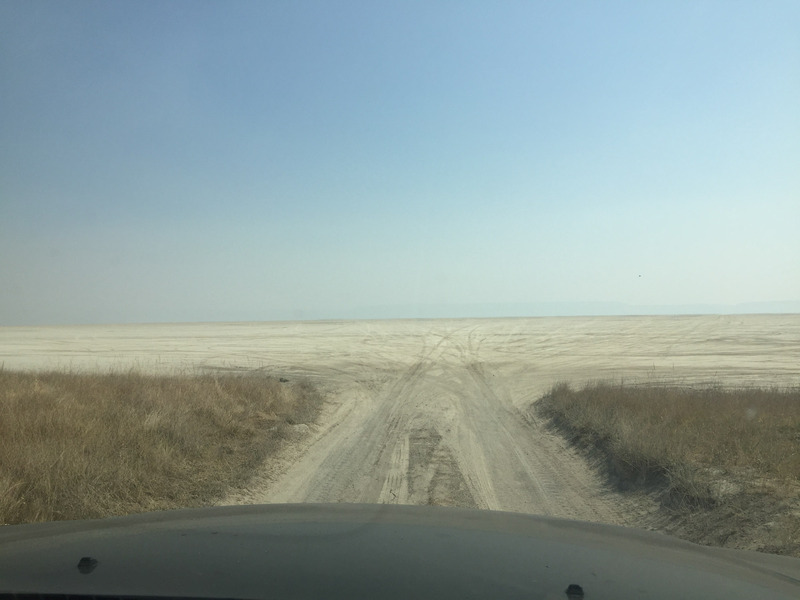 While there I noticed a smoky haze had settled and as I drove toward Fields, it gradually worsened. Winds shifted bringing a thick layer of smoke from the fires burning most of Oregon (and nearby Idaho). 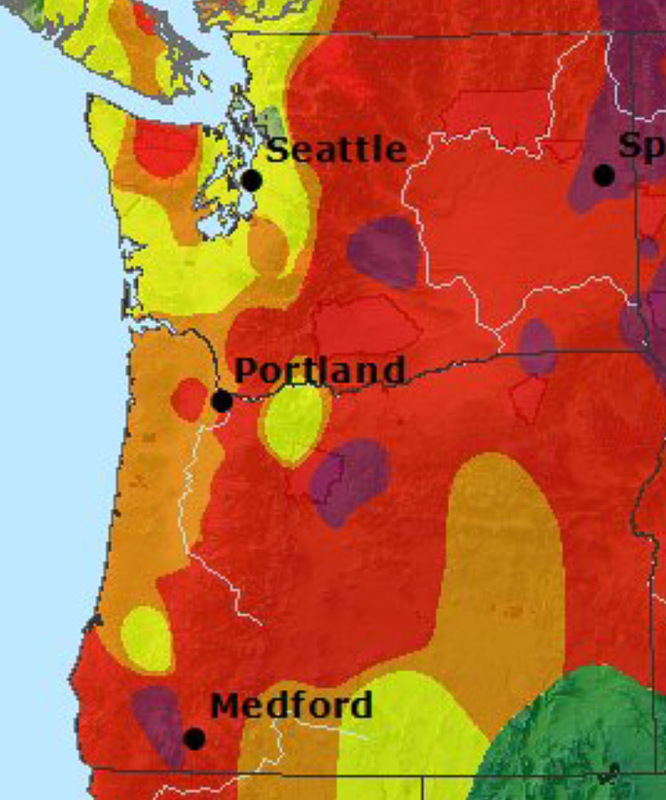 We’d hoped to avoid the smoke being so far southeast, but it finally caught up to us. Reunited at the Fields Station Cafe, Tomas and I loaded up on snacks and pondered our next move. 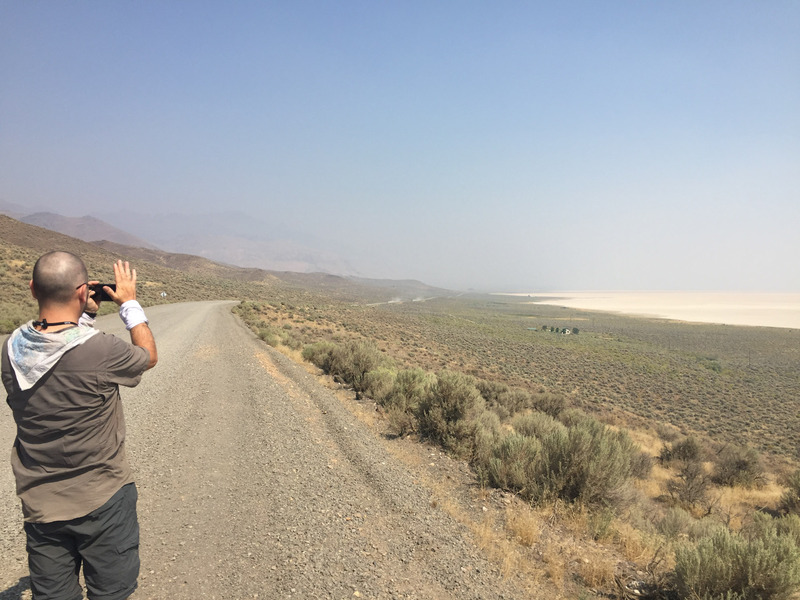 We decided to head north where his bike ride would have taken him, toward the Alvord Desert, a 12 by 7-mile dry lake separated from the Pacific Ocean by the Coast Range, the Cascades, and Steens Mountain creating a rain shadow. It averages 7″ of rain per year. 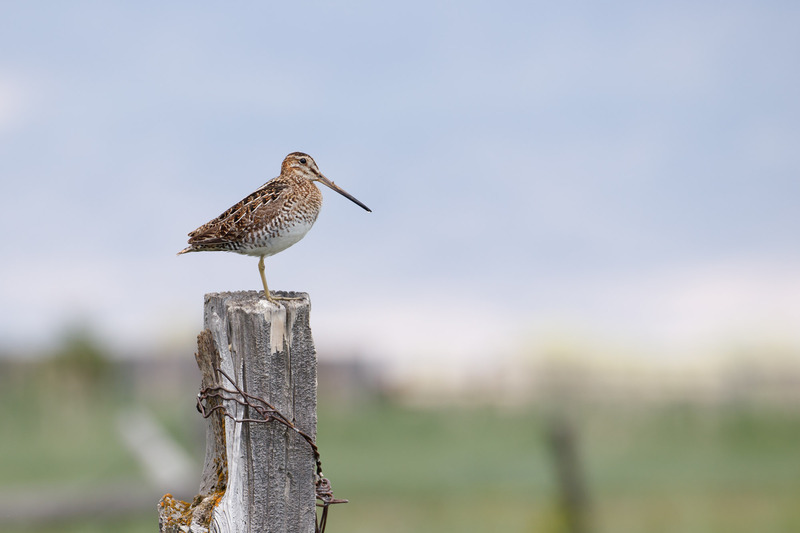 It was a part of Oregon I’ve always wanted to see and I was interested to find out what kind of birds we might find here. Unfortunately due to the wildfire smoke visibility was very poor. 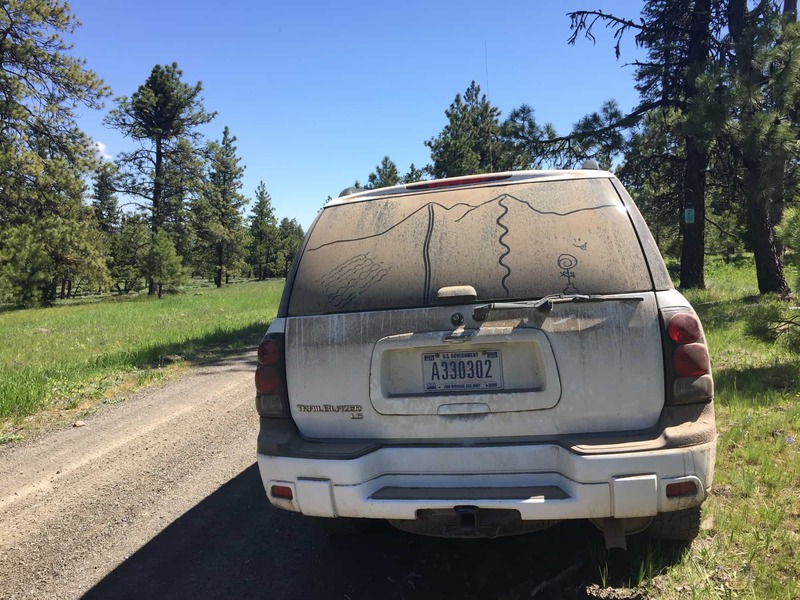 But we drove out onto it anyways. Totally legal. In fact deaf American stuntwoman Kitty O’neal set an unofficial women’s world land speed record here in 1976 at 512 mph. We didn’t set any records, but it was still fun. After doing donuts we left the desert and continued on. Where are the birds you ask? I asked the same thing. 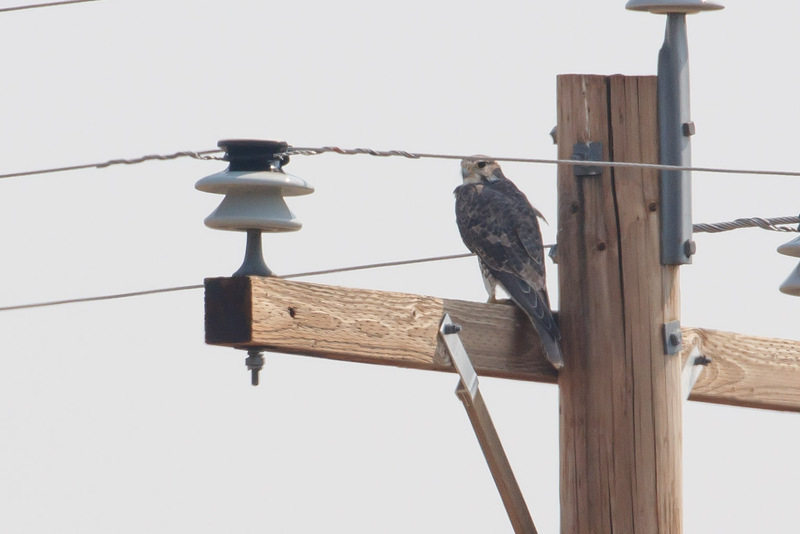 The best bird I saw in this area was a Prairie Falcon on a post. 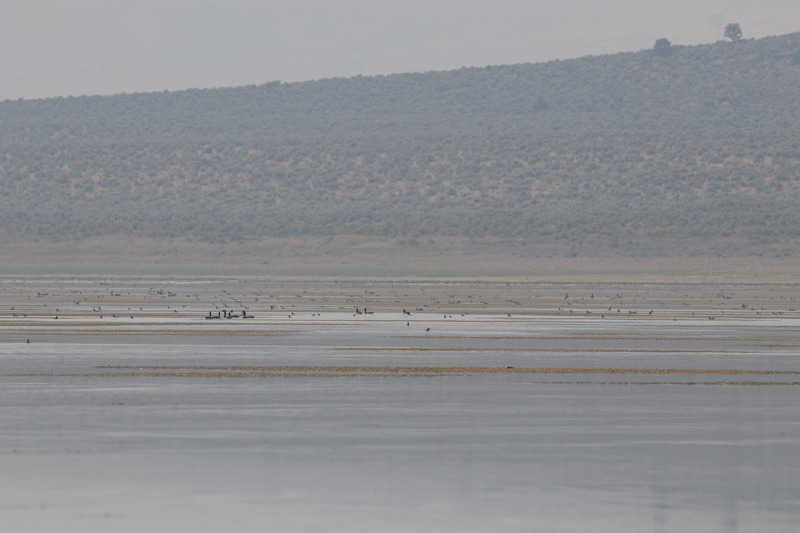 Then we stopped at Mann Lake which is supposed to be good for shorebirds and terns, but we were met with limitations. 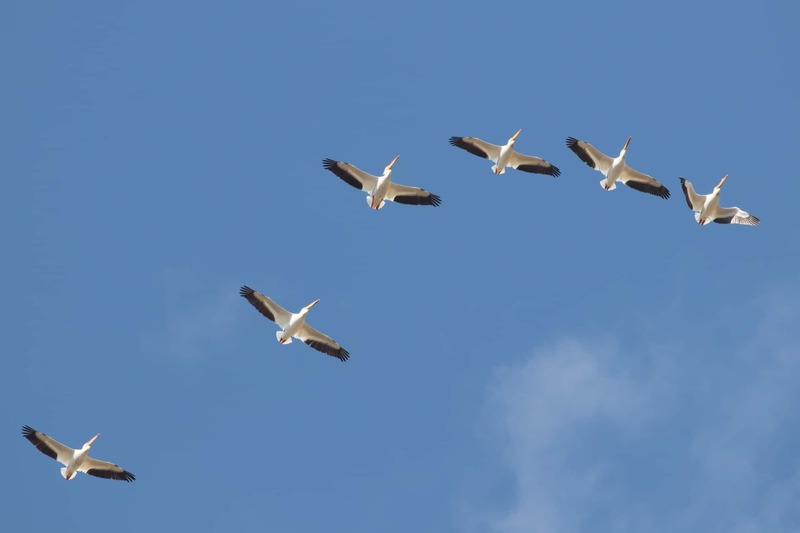 Geese? Maybe gnats. Too far, too hazy. There are several hot springs along this route, but we were already hot enough. 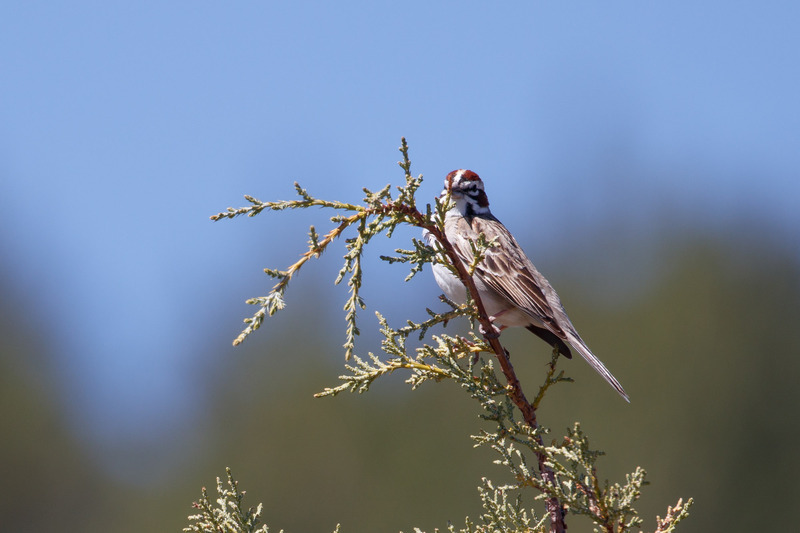 At one rest spot I found a Brewer’s Sparrow and a Lark Sparrow taking refuge in the shade. Good comparison of their size difference. 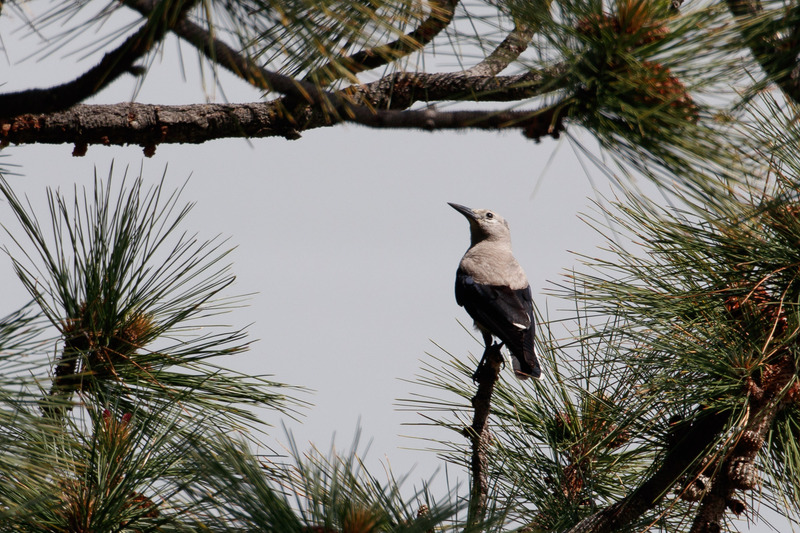 The birds were hot, panting, and disappearing into the smoky heat waves. 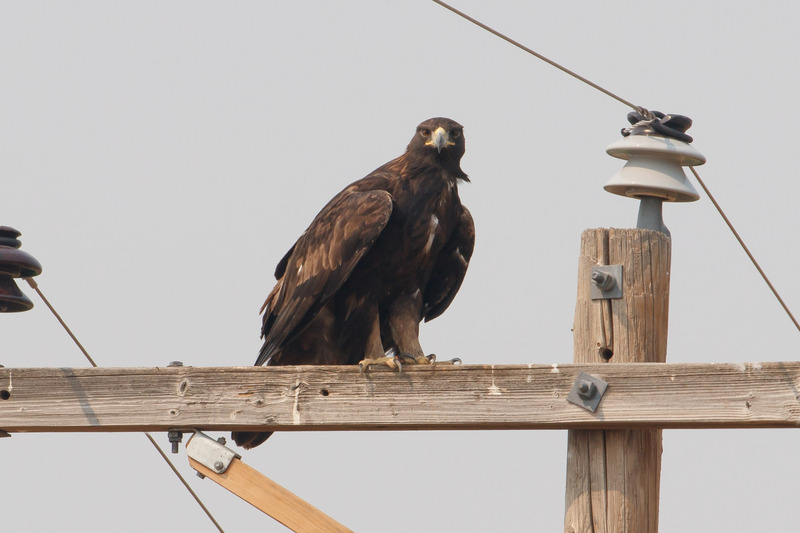 We meandered farther passing farm fields until I spotted a Golden Eagle on a power pole. 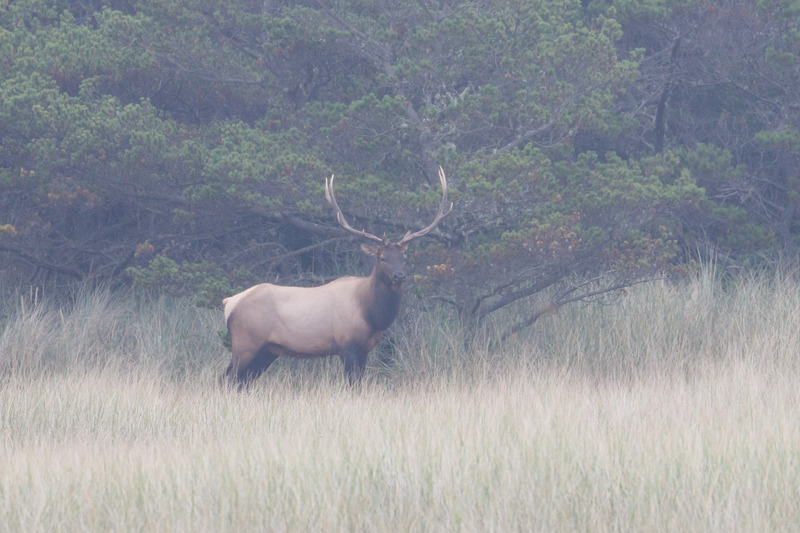 We pulled over and inched closer and closer as it tolerated our presence. Barely. I was excited for Tomas to see one since he’d drawn a Golden Eagle the first day of the trip but had yet to see any. Especially this close. 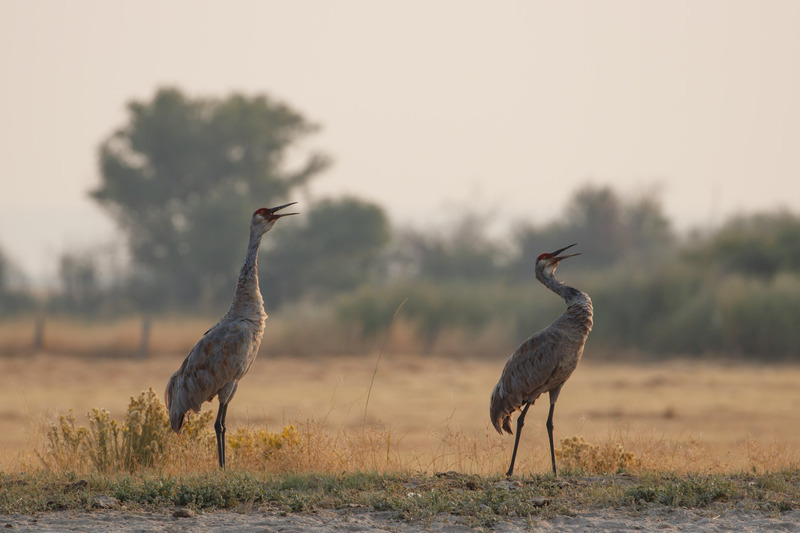 We left on an eagle high and continued along until just before Burns we pulled over again, this time for a noisy pair of Sandhill Cranes. So good. Back in Burns it was still smoky. It was also getting late. 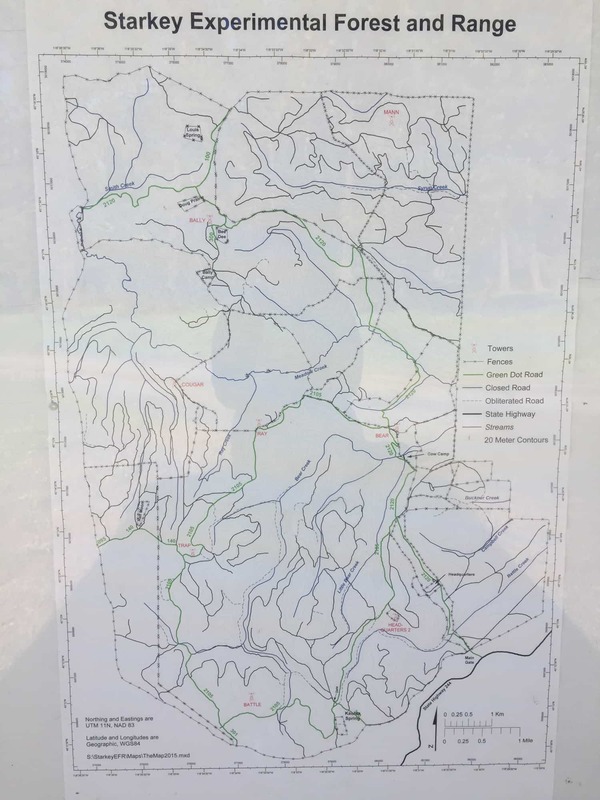 Considering our options, we decided on Idlewild campground because it was only 20 min north, higher elevation, and forested. Maybe less smoky? We stayed one night and it was slightly better air-quality wise, but not great. 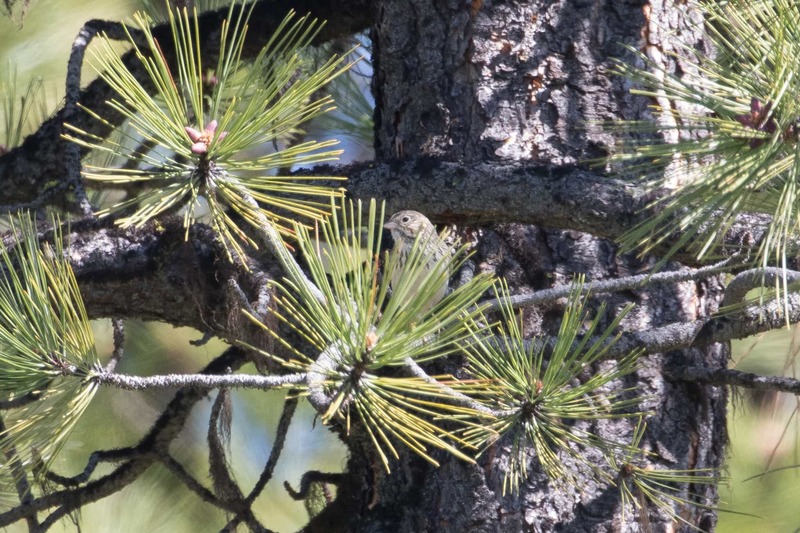 I birded the best I could, finding Williamson’s Sapsucker, Orange-crowned Warbler, Townsend’s Warbler, and Red Crossbills. In the morning we checked the Air Quality Index. It was terrible. We still had five more days, but at this point we thought about throwing in the towel and heading home. Fleeing from smoke was not the vacation we’d planned on. 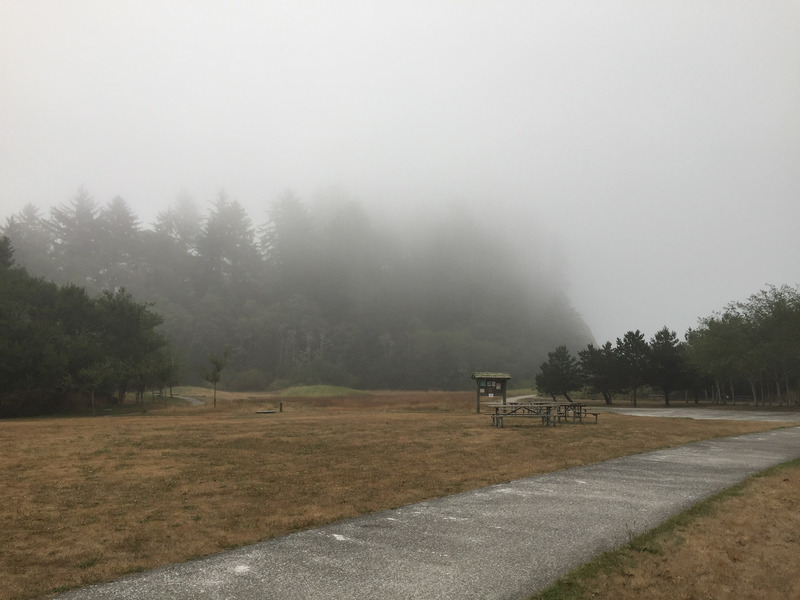 Then we learned that the Columbia Gorge was on fire (because of careless teenagers) and ash was actually falling from the sky in Portland (UGH). Home was on fire. We joked that we could probably drive to the coast. Then it stopped being funny because that’s exactly what we did. 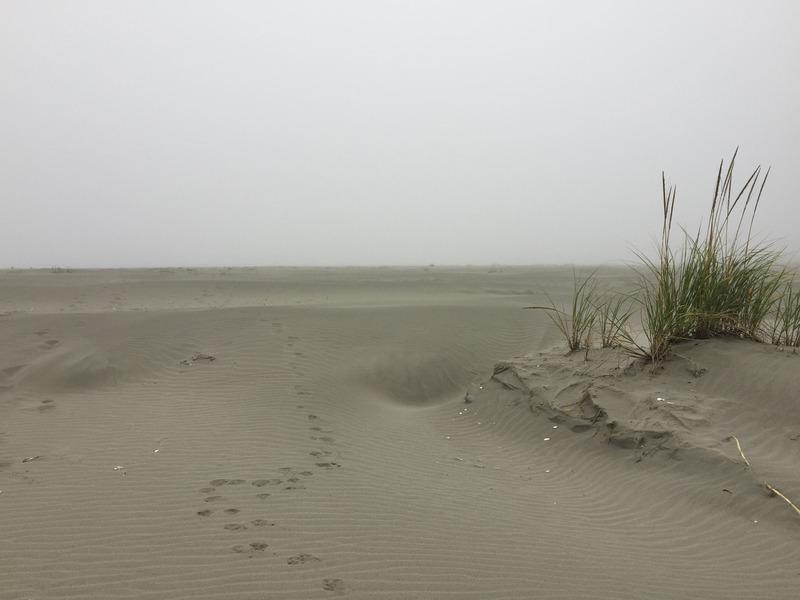 Eight hours later, we’d arrived in Astoria and traded smoke for coastal fog. I’ll be brief. It was cooler at least though visibility was still terrible. 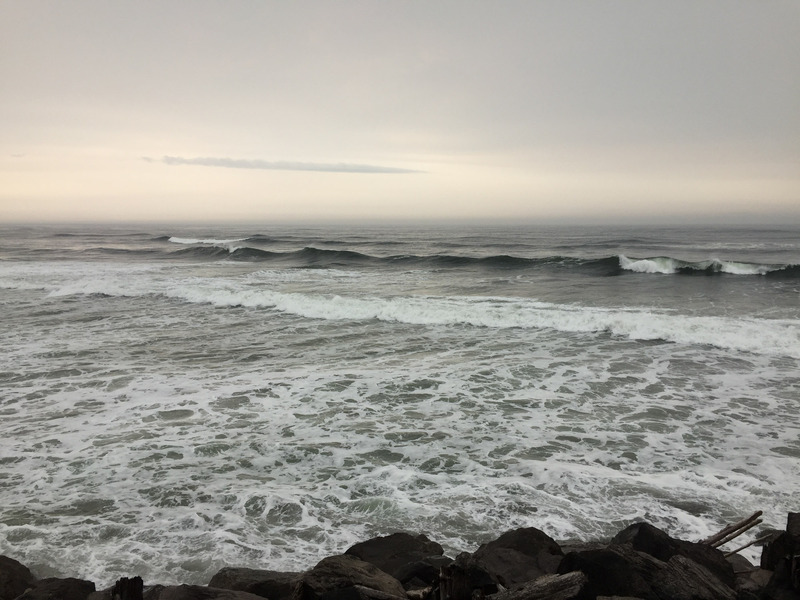 The highlight of this mini escape was the day I drove two hours farther north to Grayland Beach State Park. 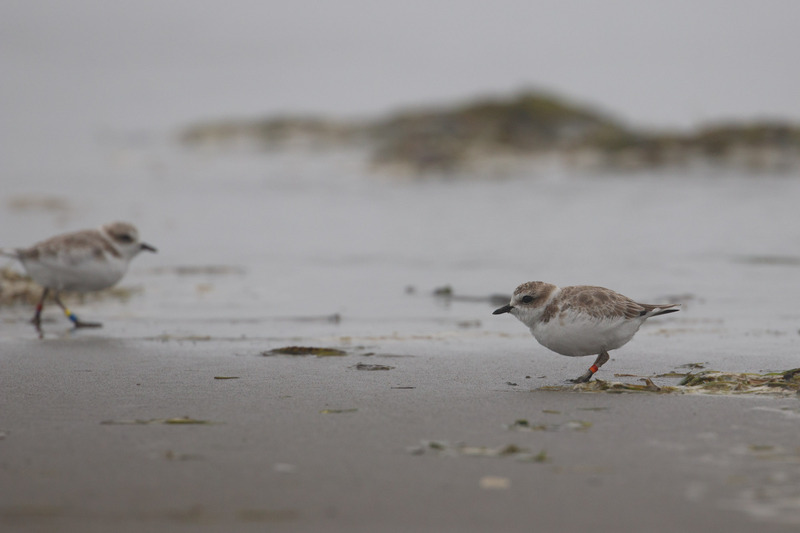 Here I saw foggy Sanderling, foggy Brown Pelican, foggy Caspian Tern, foggy elk. 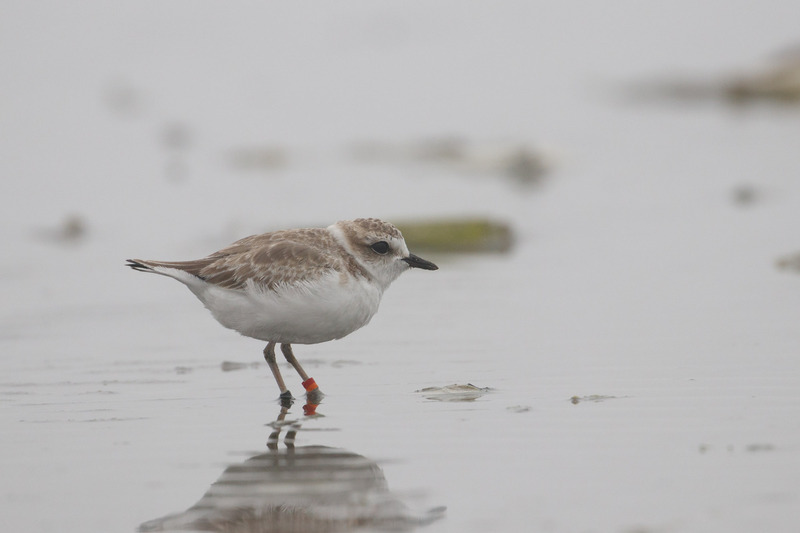 And the only life bird of the entire trip, Snowy Plover!!! Even better. There were two!! Both wearing fancy jewelry. So cute. It was great. Relaxing and refreshing, just like vacations are supposed to be. So not the trip we thought it would be but we still saw some cool stuff. Southeast Oregon is all so gorgeous and ridiculously quiet. We want to go back. 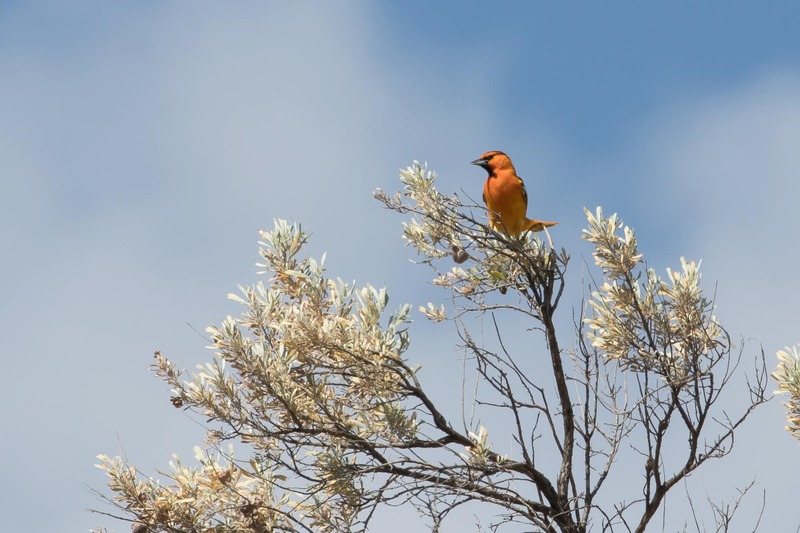 I’m thinking springtime when it’s cooler and more bird species are migrating. 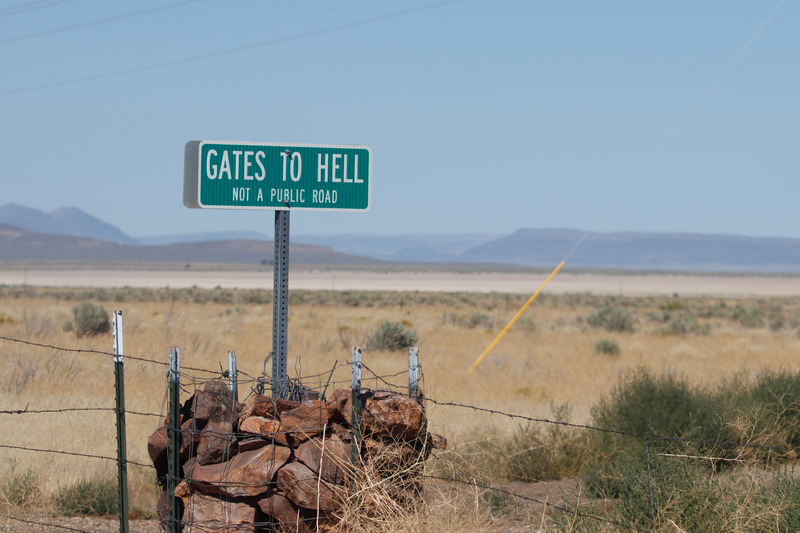 Totally worth it because Malheur is awesome and you never know what you’ll see. 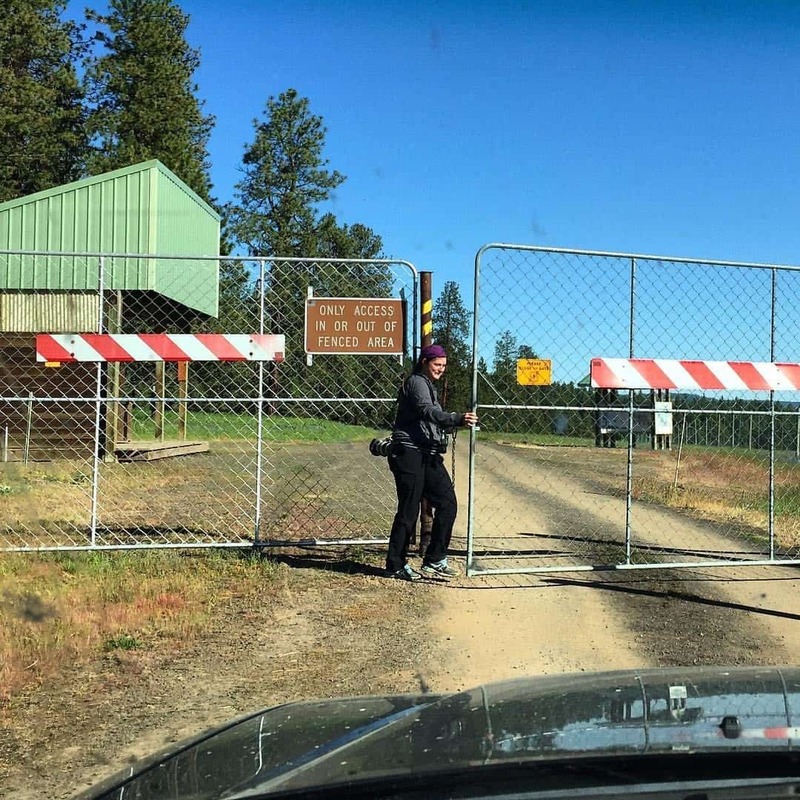 The next morning we got up, packed up, and said goodbye to the Wallowa Mountains and hello to the Starkey Experimental Forest. Say, what? Into the fenced-in wild we went. I’d read information about a Flammulated Owl study performed in this forest. Unfortunately it was from the 80s so I had no idea what possibilities it still held but it was worth a shot. 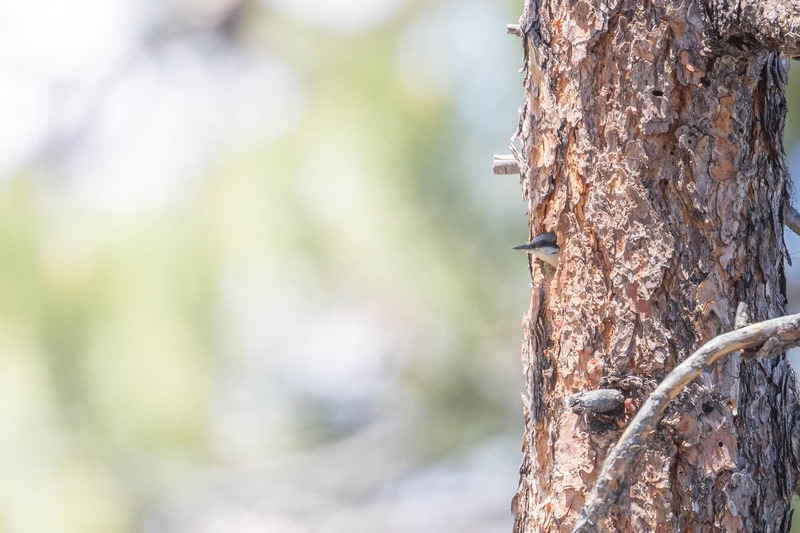 According to the paper, flammies like large diameter Ponderosa Pine snags with cavities at least as large as made by a Northern Flicker (though preferably by Pileated Woodpecker) located on east or south facing ridges and slopes. It was a starting point. The Starkey forest is 40 square miles completely fenced in with easily navigable gravel roads so we explored all over the place. And only got one flat tire. 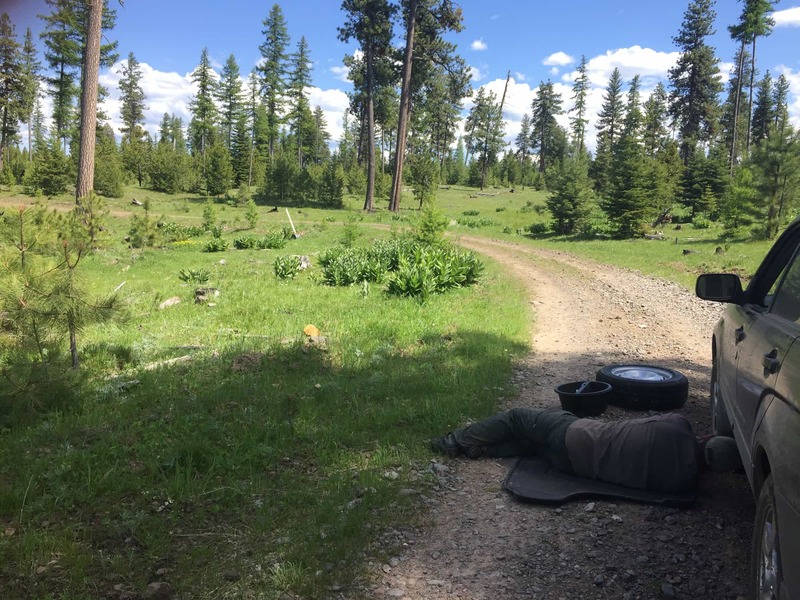 We passed coyote traps, bear traps, strange elongated nest boxes, and several game “cleaning stations” as besides research, the other main use of the forest is elk hunting in the winter. 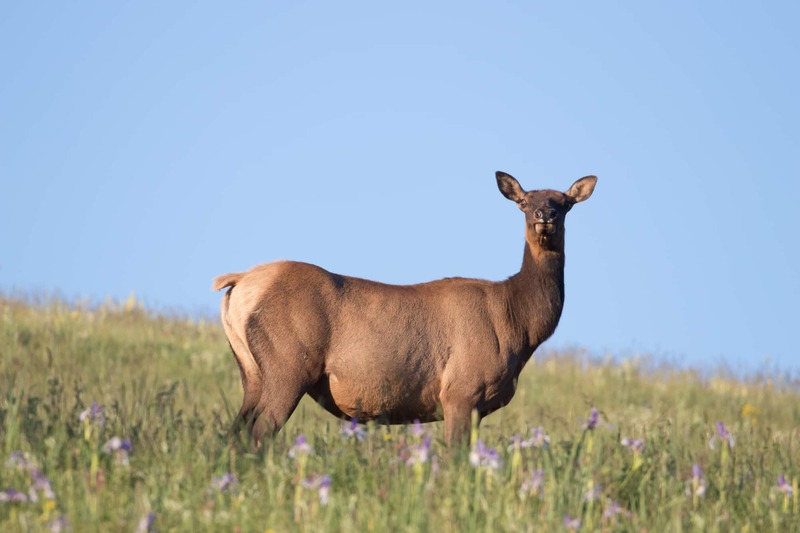 The Starkey Project researches combinations of forest management for elk, timber, cattle, deer, recreation and nutrient flows on National Forests. We couldn’t find any information about camping, but we passed a car with grad-students/employees inside that said it was okay. They were pretty chill. The whole place was. There were no other people camping or otherwise. It was a nice break. Even if it did make me think of the Hunger Games arena. The odds were in our favor. 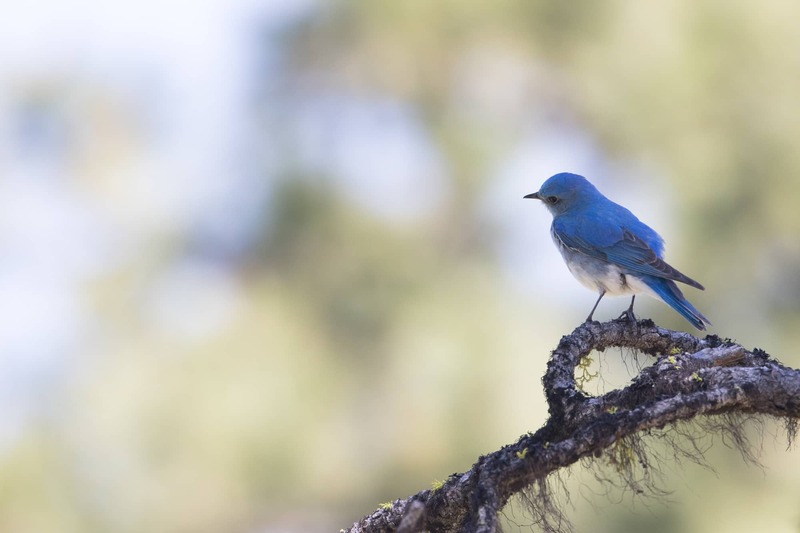 We found Mountain Bluebirds. 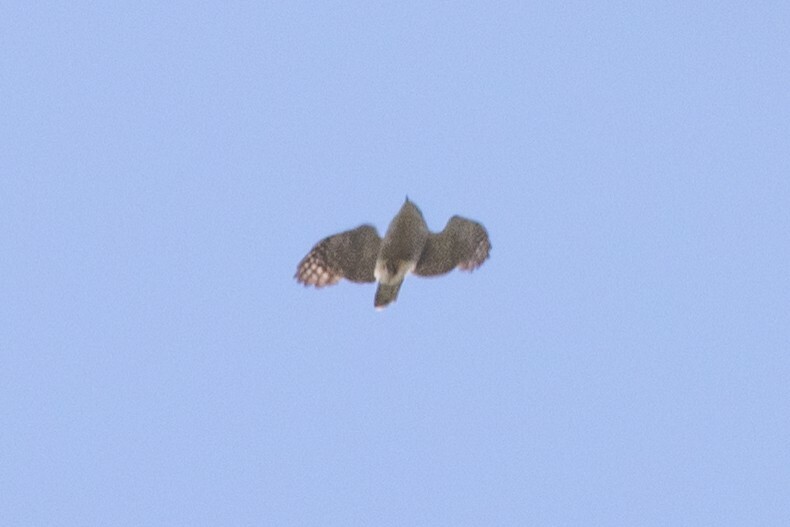 The worst view ever of a Northern Goshawk. 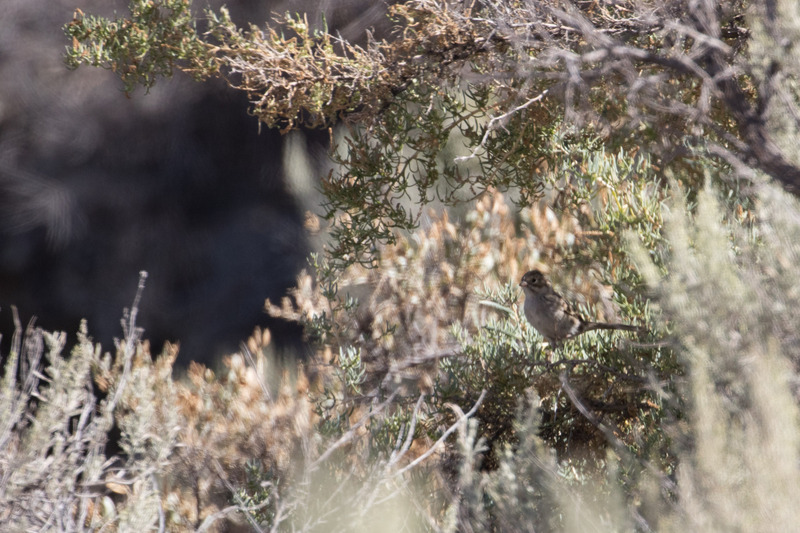 A sneaky sparrow I think is a young Vesper’s Sparrow. 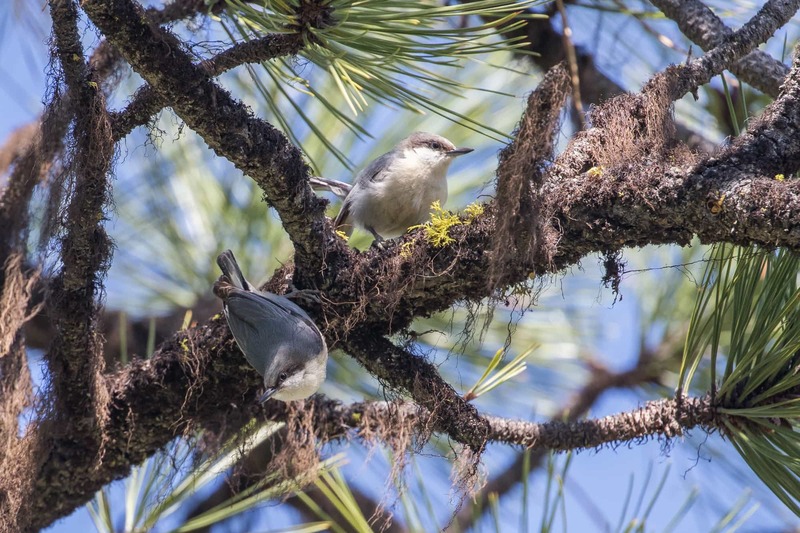 And so many Pygmy Nuthatches. 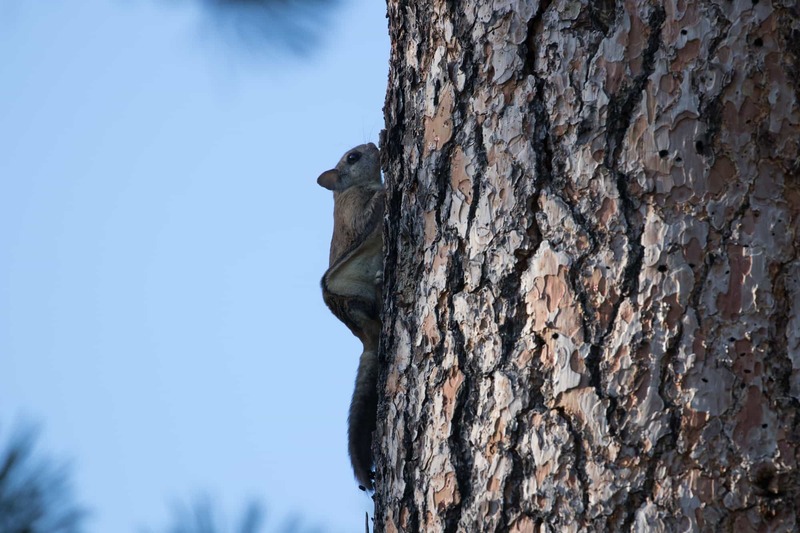 Out peeked a Northern Flying Squirrel! No way. It climbed out for a brief moment and then scurried back into it’s hole. 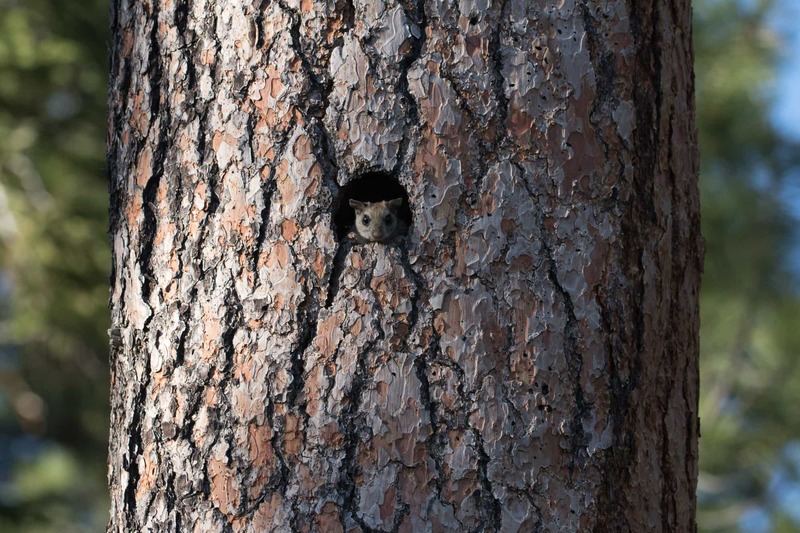 Not an owl, but still a great find. 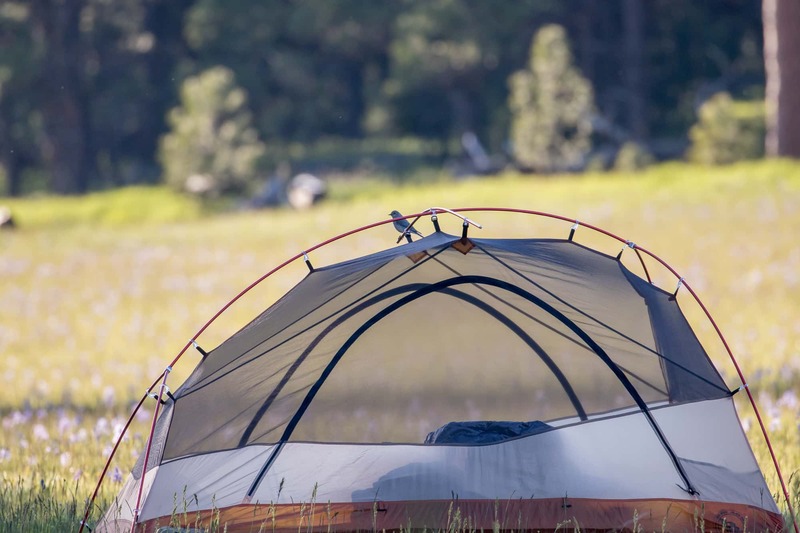 Meanwhile, a Mountain Bluebird found our tent. We settled back in to camp hoping to hear owls in the night, but I slept too soundly and didn’t hear a hoot. Sad to leave the forest we packed up for the trip home. 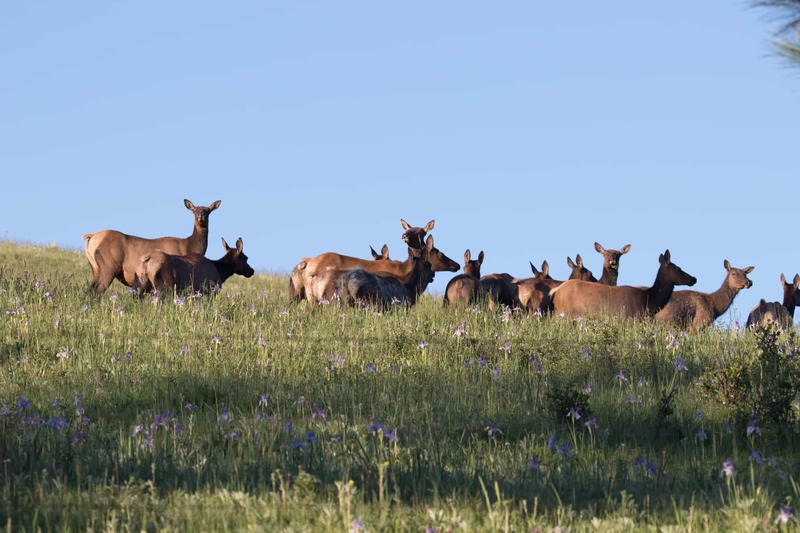 Oddly enough we hadn’t seen any deer or elk in the Starkey Experiemental Forest, it wasn’t until we were beyond the fence boundary that we bumped into a herd of elk. 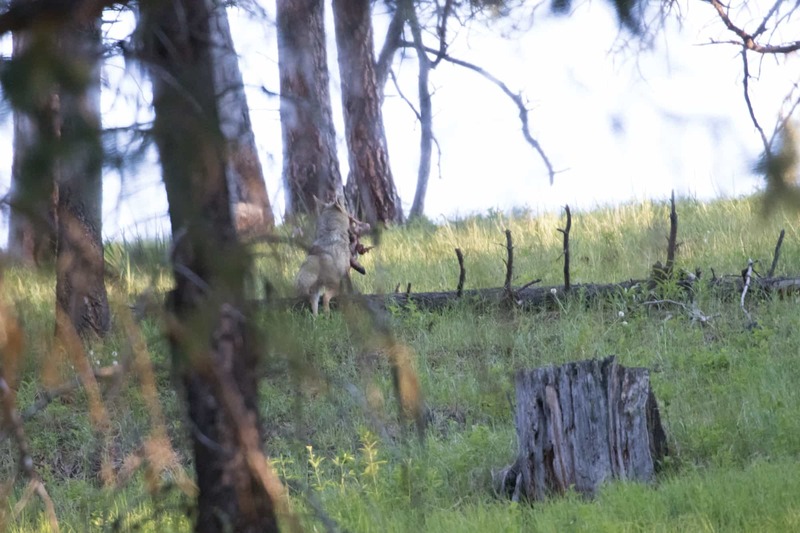 This is also when we saw a coyote run across the road carrying a big hunk of a deer carcass. I managed one terrible photo. Neat. So much excitement outside the fence perimeter. On the way home we made a point to stop at Philippi Canyon because there’s always something good to find and this time did not disappoint. 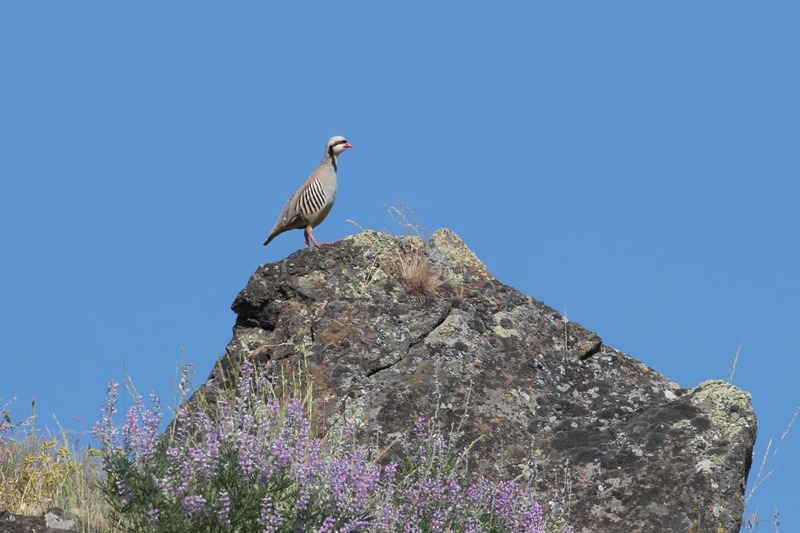 The biggest surprise was a Chukar that didn’t run away! At least for a brief enough moment. Another fabulous trip to eastern Oregon with much to sing about!